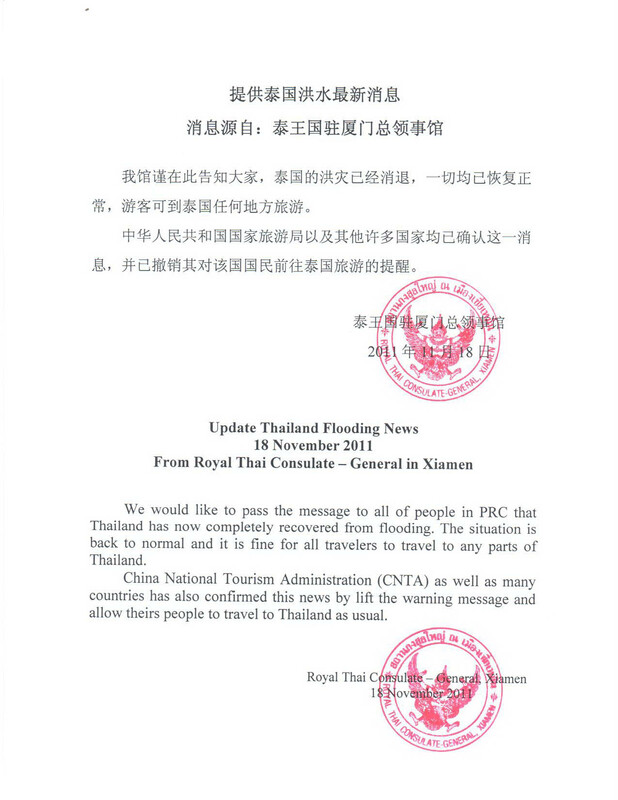 The Royal Thai Consulate-General in Xiamen has issued an updated Thailand flooding news to announce that Thailand has now completely recovered from flooding and it is safe for tourists to travel to any parts of Thailand. Although the flood mainly affected provinces in the Central Region, it had minor impact on tourist attractions throughout Thailand. Popular destinations in the North; such as, Chiang Mai and Sukothai; in the South; such as, Phuket and Krabi; and even in the Central Region; such as, Hua Hin and Pattaya, were not affected. Central Bangkok also remained dry, as did Suvarnabhumi Airport. The World Heritage Site in Ayutthaya, the most notable tourist attraction to be flooded, is undergoing restoration but is fully accessible. It has already seen an increase in the number of foreign visitors. The China National Tourism Administration (CNTA) has revoked the travel warning to Thailand on 23rd November, 2011. And many countries have also confirmed this news by lifting the warning message and allow their people to travel to Thailand as usual. Since late July this year, Thailand has suffered major floods during the 2011 monsoon season. The floods have caused 602 reported deaths by early November, affected over 2.3 million people.